See the highlights of Los Angeles on this 3.5-hour sightseeing trip with a local guide. From the historic architecture of Downtown Los Angeles, to the bustling energy of the Hollywood Walk of Fame and the TCL Chinese Theater, it doesn't get more "L.A." than this. Stop at the Griffith Park Observatory for great views of the Hollywood Sign, then ride past select celebrities' homes, peek into the shops on Rodeo Drive, in upscale Beverly Hills where the rich and famous mingle. Round-trip transportation from Most Downtown Los Angeles or Hollywood hotels is included. Want to experience the must-see highlights of Los Angeles, but don't have an entire day to do it? This 3.5 hour afternoon tour is the answer. Hotel pickup is available from select hotels in Hollywood or Downtown L.A. from 1:30–2:15pm. Once your small group's all aboard, begin in Downtown Los Angeles with a stop at the crossroads of art and culture: The Music Center. See the Dorothy Chandler Pavilion and take photos at Walt Disney Concert Hall, known for its soaring, curved steel exterior designed by Frank Gehry. Then on to Southern California's gateway to the cosmos, the Griffith Park Observatory, where you will get to see the panoramic view of the City of the Angels, and the famous Hollywood Sign. No trip to Hollywood would be complete without a stop at the famed Grumman’s Chinese Theater, where you can walk among the cemented hand-prints and footprints of Movie Stars from the past and present. 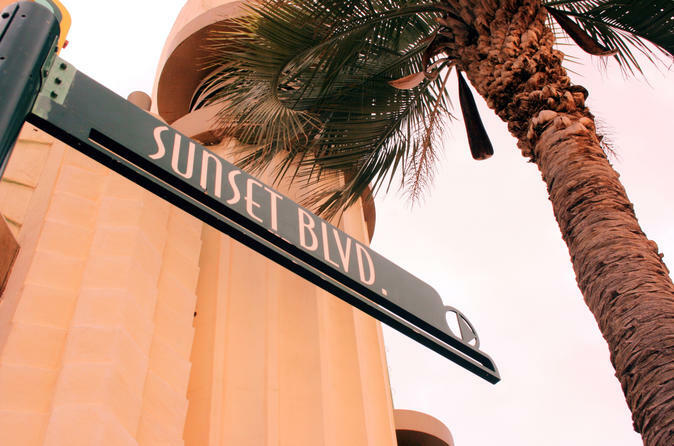 Take time to stroll along Hollywood Blvd. and find the star of your favorite entertainer on the Hollywood Walk of Fame. See the Dolby Theater, home to the Academy Awards (The Oscars). Next, your tour will cruise along the storied Sunset Strip, where you will see the recognizable bars, restaurants and nightclubs that today's young and hot in Hollywood frequent all day and all night long. The tour continues West into the gorgeous neighborhoods of Beverly Hills , where you will be guided through our top selection of Movie Stars Homes and the famous Beverly Hills Sign. But it doesn’t stop there, you’ll see where the rich and famous spend their money at the world’s most exclusive boutique shops with our drive along glitzy Rodeo Drive. This all-encompassing tour includes pick-up and drop-off from most Downtown or Hollywood hotels.